Waking up on a quiet beach after a night of storms and scared pups is still waking up on a quiet beach and therefore refreshing and life-giving and absolutely perfect for vacationing. Waking up on a quiet beach and promptly grabbing an iced latte for her and a fresh lemonade for him adds to the perfection. 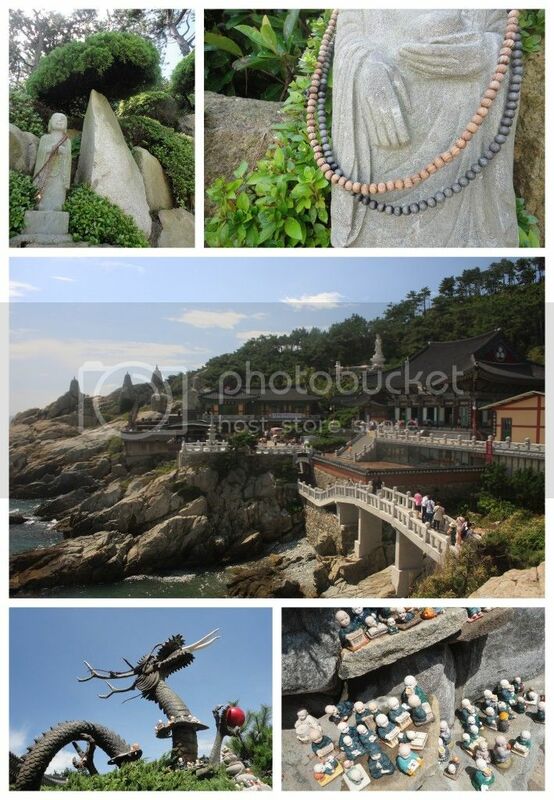 Waking up on a quiet beach and having the perfect morning beverages in hand and making your way to a seaside Buddhist temple reassures you that life is in fact precious and beautiful and that vacations are essential to the soul. 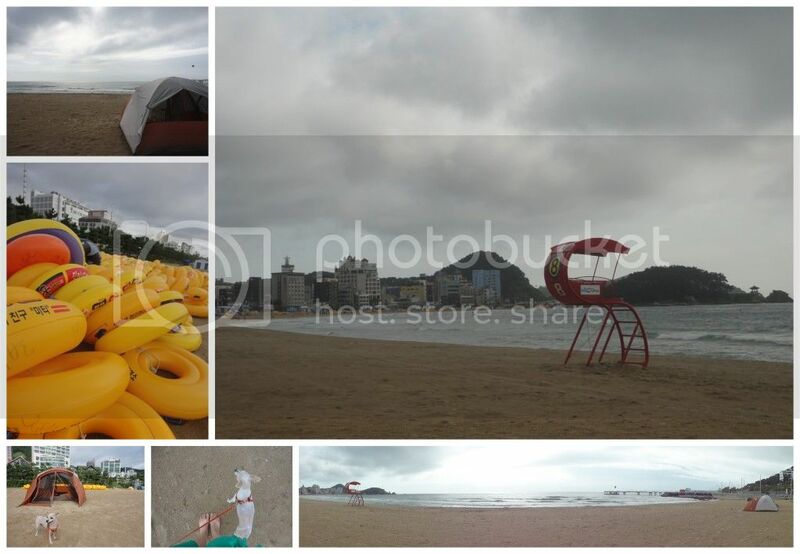 Filled with peace and caffeine the Harringtons made their way to Busan's famous and insanely crowded Haeundae Beach where they lounged under a parasol, watched the waves and the swimmers, read and snoozed while waiting to hear from their 'last galma guest'. As fortune occasionally dictates, the phone which had been lent to Mandy happened to die, leaving her disconnected to her 'hosts'. As fortunate would see fit, however, the hostel owner quickly problem solved by having the phone charged at a nearby convenience store which is common and acceptable in the great nation of South Korea. Additionally, fortune had dictated for a time to be pre-determined and as that time approached with no communication between Harringtons and guest Mandy, Melissa was soon sent out to the hostel to track down her friend. The girls met in the elevator of the hostel and all worries were quickly eased as they prepared to return to the beach and swimming. 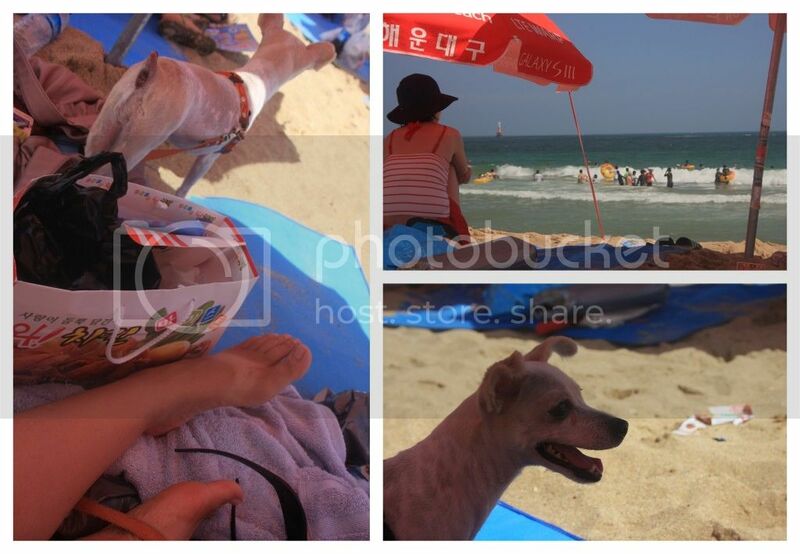 Aside from the simple joy of being on a beach and in the waves, another highlight of life at Haeundae in the summer is being offered Chicken and Beer while laying out under your parasol. Obviously, with hunger setting in, this crew of waygookin's eagerly agreed to a box of chicken and spent the afternoon snacking, lounging, swimming and chatting before cleaning up and heading out for final dinner as Harringtons and 'last galma guest' which consisted of tacos and burritos from the Fuzzy Navel. Dinner was followed by makgeoli on the beach with special appearances by Sri Lankan laborers, a flirty Korean man and a beautiful sunset. All too quickly, the evening came to an end and the Harringtons bid farewell to Mandy, wishing her an enjoyable evening and final days in the land of kimchi while they re-loaded the Matiz and made their way westward to find a camping location and inch closer to the island-get-away portion of this final road-trip/Korean vacation.